A land trust is a 501(c)3 non-profit organization dedicated to the conservation of land and water. Q: How do you protect land? Land trusts can protect land in several ways. Conservation easements are the most effective tool because they keep land in private ownership and management, are cost effective, and convey the strongest legal protections. Land trusts may also protect land through fee ownership, and may facilitate and assist private and public landowners with transfers for conservation benefit. A conservation easement is a voluntary agreement between a private landowner and a land trust that permanently restricts and defines the amount and type of development that is permitted on a property. When a landowner’s vision for their property is one of little change, a conservation easement can be a useful tool. San Isabel Land Protection Trust doesn’t tell landowners how to manage their land, but focuses on the big picture by preventing subdivision, inappropriate industry, and the sale of agricultural water rights. A conservation easement does not grant public access nor any authority to any government agency. Q: What is land conservation? Land conservation is the protection and maintenance of large, productive and natural private properties to avoid development, subdivision and dry-up. Although land conservation, land protection, and land preservation are used synonymously, conservation implies continued private use, production, and management. Preservation is often used to connote minimal human use, such as wilderness. Q: Why is it important to tie water to the land? Water is life. Agricultural productivity, the quality of wildlife habitat, forest health, and other ecological benefits all depend on water. In the arid West, sufficient irrigation water is essential to agricultural productivity. Local agriculture, which is critical for the local economy, our western heritage, and national food security, all depends on water. Agricultural irrigation water also provides many secondary benefits. Wetlands are created by ditch seepage and return flows, improving water quality through filtration and sediment removal, and enhancing wildlife habitat for a number of species. Green fields are favorite food sources for wildlife, and their beauty is important to tourism. The demand for agricultural water is huge, and expected to grow. Water rights of the Arkansas Basin, where San Isabel Land Protection Trust is located, have been and will continue to be purchased to provide for growing cities and industry on the Front Range and elsewhere. The ‘dry-up’ of agricultural land is a one-way street; once sold, the costs to buy it back are prohibitive. Conservation easements provide an economic alternative to “buy and dry” development, and tie water to the land for these many reasons. Q: How do I place a conservation easement on my land? Donating or selling a conservation easement is fundamentally a real estate transaction, memorialized by the conservation easement contract between landowner and land trust, recorded with the county where the land is located. Considerable due diligence, documentation and negotiation is involved which typically takes 6 months to 1 year. For a detailed explanation of the steps involved in donating a conservation easement, please see here. Q: Is it expensive to donate a conservation easement? Conservation easements generate significant income to landowners, but there are transactional costs ranging from $28,000-$50,000. There are loans available to landowners, and under special circumstances some fees may be deferred until the sale of tax credits generates the cash required. Q: I want to buy a piece of property that has a conservation easement on it. What do I do? Your real estate broker should provide you with a copy of the conservation easement. If the property you are interested in has a conservation easement held by San Isabel Land Protection Trust, we’d be happy to discuss the terms of the conservation easement, including any reserved or discretionary rights. Please contact our office to make an appointment. Q: How can conservation easements help in succession planning for family farms and ranches? Ensure that your family property is passed down intact through generations. Generate cash to invest in the operation or another business. Generate cash to allow some family members to “buy out” siblings or other family members not interested in the land and operation. Minimize or avoid estate taxes by reducing the value of the estate and providing a non-taxable exemption. Q: How does a conservation easement protect my property rights? A conservation easement is itself the exercise of property rights, and through the easement the landowner gains an ally in the land trust that is prepared to help defend their property rights, particularly challenges to the water rights. Q: Does a conservation easement give any control over your property to the government? Q: Does a conservation easement give the public access to my land? Q: How do I transfer my land to an heir and deal with inheritance tax? Making a plan for your property is one of the most important things you can do. Your land is your legacy, and it plays an integral role in preserving the rural heritage and natural resources of our region. Donating a conservation easement is a tool that you may use to assist you and your family in many ways, including reducing estate taxes, generating revenue to allow equity among heirs and ensuring that your land and water will be protected, forever. Because you are effectively contributing to the public good by preserving the value of the land, you may receive significant state and federal tax advantages for granting a conservation easement. Visit our estate planning page to learn how a conservation easement may assist you with your estate planning. Q: How do I support a land trust? You can help San Isabel Land Protection Trust protect working ranches, critical wildlife habitat, productive agricultural lands, water, and wide open spaces in many ways. One of the most helpful ways is by making a donation. You may also volunteer your time and services. Our supporters are vital partners in helping us protect our land and water. Click here for more information. Q: How can I make a tribute gift? To honor someone special and to pay tribute to their life, you may make a tribute gift in their name to San Isabel Land Protection Trust. You may make a donation online or by contacting San Isabel directly. Q: How can I make a gift in honor of someone? Making a gift in honor of someone is a meaningful way to pay tribute to that special person in your life while supporting the mission of San Isabel Land Protection Trust. In Honor Gifts are often given on special occasions such as a friend's or relative's birthday, Holiday’s, Earth Day, Mother’s Day or anniversary. They are often given to show appreciation for someone's kindness or to recognize their impact on your life. To make a gift online in honor of someone, please go to our donation page. Thank you! Q: Can I sell or donate my property to San Isabel? Donating or selling land to a charitable organization is a generous act, creating a legacy for your family and the community. San Isabel Land Protection Trust accepts gives of land or other real property. Any such gift would be carefully evaluated on the need for formal land protection or as an asset to be sold to further our mission. If you are considering giving land to San Isabel or another nonprofit, we encourage you to talk to us to plan for the maximum benefit of your gift. We strive to honor the wishes of our donors and can facilitate careful planning to achieve their goals. Q: How do I make monthly gifts to San Isabel? Making a monthly gift to San Isabel Land Protection Trust is a great way to spread your donation out over a longer period of time – all while supporting the important work of the land trust. To sign up online to make a recurring monthly gift, please click here. 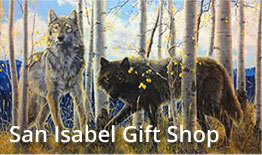 To speak with someone directly about your monthly gift, please contact San Isabel at 719 783 3018. Q: If I buy an item through the online store do the proceeds go to San Isabel? All proceeds from items sold through our online gift store go directly to San Isabel Land Protection Trust to further our mission of protecting land and water. Q: How do I donate goods or services to San Isabel Land Protection Trust? There are multiple ways to donate goods and services to San Isabel Land Protection Trust. Please visit the donation page on our website to learn more, or contact San Isabel Land Protection Trust to speak with someone directly. Q: Who funds San Isabel Land Protection Trust? San Isabel Land Protection Trust is a nonprofit 501(c)3 organization. We rely on the generosity of memberships; private, individual gifts; and donations to fund our work. We also derive revenue from project fees, investments and grants. Q: Are donations to San Isabel Land Protection Trust tax deductible? San Isabel Land Protection Trust is a nonprofit 501(c)3 organization, and donations are tax-deductible. The amount of the gift that is eligible for deduction can depend on several factors, including the size and nature of the donation. San Isabel does not provide legal, tax or accounting advice. You are encouraged to consult your own professional advisors on tax matters. San Isabel Land Protection Trust’s tax ID number (EIN) is 84-1311010. Q: What is San Isabel’s tax ID number? To join San Isabel Land Protection Trust, please visit our donation page or contact us at 719 783 3018 or info@Sanisabel.org. We consider anyone who makes an annual donation to San Isabel a member. Q: How do I contact San Isabel Land Protection Trust? Volunteers have been vital to our success and are a part of every aspect of our organization. Without the on-going support of our generous volunteers and supporters, San Isabel Land Protection Trust would not be where we are today.